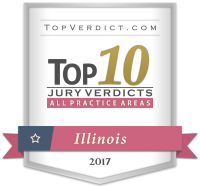 Voted "Best Law Firms" by U.S. News! If you or a loved one was hurt or killed in an Illinois construction accident, take time to speak with an attorney about your options. Our team of Chicago construction accident attorneys at Power, Rogers & Smith, L.L.P. knows the nuances of these cases and we understand how to protect your rights. Attorney Todd Smith has achieved multi-million dollar judgments and settlements involving construction accidents. He and Attorney Joe Power achieved what was then a record multi-million dollar verdict in a carpenter's death at the Newberry Plaza construction project. Attorney Devon Bruce also has years of experience, and a history of success that includes multi-million dollar recoveries including a $9M jury verdict in a construction accident case, which was upheld on appeal after being heard twice by the Illinois Supreme Court. Construction site accidents affect thousands of American workers annually. According to the Occupational Safety & Health Administration (OSHA), more than 4,000 workers were killed in the private industry sector in the United States, and more than 1 in 5 - over 20% - of these fatalities happened in construction. Make the strategic choice after an accident! If you or a loved one was injured on the job, we invite you to speak with one of our Chicago construction accident lawyers for an evaluation. Schedule a free consultation with our team: Call Power Rogers & Smith today at (312) 313-0202. Can I Get More than Just Workers’ Compensation? A: Workers’ compensation does not compensate victims for emotional damages or pain and suffering. However, some laws make it difficult for employees to seek additional funds for their injuries. Speak with an attorney about the details of your case to see if you are able to pursue more than your workers’ compensation claim. Who is Responsible for Making Sure the Work Site is Safe? A: Your employer is responsible to make sure your work environment is safe. If you suffer a serious, on-the-job injury, your employer may be at-fault for your damages. In turn, you may be able to pursue compensation through a workers’ compensation claim or a lawsuit. A: The law does not require you to work with a lawyer, no. However, construction accident liability can be complex. By working with a law firm with construction accident litigation experience, you will have additional guidance and insight regarding your case.